This article discusses some thoughts how to build a basketball program for your school and community. This is not the same as building a college program, which involves many other things not discussed here, such are recruiting, fund-raising, program promotion and others. Will I have the support of the school's administration, faculty, and the community? Do I have a passion for the game? Do I have the energy, the desire, and good health to take this on? What will I get from doing this? How will this benefit me? What can I give to others by doing this? What are my priorities and goals? What's important? These questions are not meant to scare you away! We need dedicated coaches willing to help young people down the right path, while teaching the game of basketball. But these are things you should consider. First, make sure you have the support of administration. Hopefully, they feel that what you want to accomplish is important for the school and their students. Taking over a successful program... perhaps the old, beloved coach just retired. You are the new guy or girl in town. You may feel more pressure to win in taking over this kind of a program. You may feel more strapped into following a certain style of play... the style that has been successful here for the past number of years. I know of a nearby town that won the State Championship over 30 years ago, playing 2-3 zone defense. Well, the 2-3 zone has been played there every year since then, and I think if a new coach tried man-to-man defense, he'd be run out of town (not unlike the movie "Hoosiers"). Of course the advantage of taking over such a program is that much is already in place. Talent is there, community pride and support, and that winning attitude are already on board. Players know what it's like to work hard, and will work in the off-season. Taking over a win-less program... in this situation, usually there is less pressure to be immediately successful, and you can insist on being in charge of things. But the school and community must know that things do not improve in one season (usually), and that you need a time commitment of several years to bring the program along. A great video from UConn head coach Geno Auriemma. Here we are talking about your basketball coaching philosophy. How do you want to play the game... fast tempo, full-court pressing, or more of a slow-down deliberate style. Or are you willing to completely change from year to year based on the talent you have? Whatever is your style, you must have your own "system". Teach this system all the way through your program, including at the junior varsity and freshmen levels. But don't be over-bearing. Allow your other coaches to put in some of their own plays too. Hopefully your school's administration will allow you to have major input in selecting the junior varsity and freshmen coaches, and will allow you to select your own volunteer assistants. A very large part of developing a successful basketball program is surrounding yourself with good people who share the same coaching philosophy, the same passion for the game, are knowledgeable, and above all, are loyal to you and want to help you succeed (see "The Assistant Coach"). You certainly don't want an assistant or a JV coach who tries to undermine you and your authority, in hopes of getting your job. Such a person should be gotten rid of immediately. You are the leader of the program and must provide that leadership. Tell people what you want, what you expect, what type of basketball system should be taught to younger players, etc. But don't try to do it all yourself! You would be surprised how many people are willing to help you as volunteers. Use your resources, involve others. You need assistants, managers, and statisticians. You will probably need a person who films games and will edit them for you. You need someone to run the clock and the scoreboard, and someone to do the scorebook. You need an announcer, and someone to organize the music at games. Who's going to sell the popcorn and pizza? Get your middle school coaches on board and involved. Meet with them before the season starts and point out some things that you would like taught to the younger kids. But don't stifle their own coaching creativity. Part of the fun in coaching is putting in a few of your own plays and strategies. So don't be over-bearing and take that away from them. In fact, be open to ideas and you might learn a trick or two from them. There will be some knowledgeable parents who want to help. Oftentimes, they will be willing to help in coaching youth teams in your community. Meet with them and explain what you would like the kids to learn. Put on a coaching clinic to help them. Don't worry about them teaching the wrong things... just getting the kids in the gym and playing is helpful. If you acknowledge these youth coaches as important to the success of the program, you will make them feel that they are a part of the team, and they will be less likely to become your critics instead. It starts with teaching fundamentals and having a good work ethic. In youth and middle school practices, probably 80% of practice time should be devoted to learning fundamentals. As kids get older, the percentages change a bit with more time spent on team skills. But even at the varsity level, we spend at least 50% of our practice time working on fundamentals. Planning practices is vital. Each player (and coach) owes it to the others to practice and play as hard as he/she can. Players must be willing to work in the off-season. Players must develop the discipline to do every drill in every practice the right way, and to compete every day in practice. Of course this doesn't always happen... but it's a goal. We start with little kids clinics, 2nd-4th graders (boys and girls). We run 90-minute sessions every Saturday morning for six weeks during the season, teaching fundamentals. A few of our varsity players come in and help. This is good for our varsity players to "give something back", help kids, and to be involved in building the future. The young kids benefit from their instruction and example, and of course, there is the "hero-worship" thing too. Being around their heroes, they want to become basketball players. The campers all get to play at the halftime of a JV or varsity game, and this is fun for them, their parents, and the fans. Summer camps, team camps, individual camps are all important. We encourage the kids to just get out in the driveway and practice outside when the weather is nice. A team that loses a lot expects to lose. Winning teams expect to win. When taking over a program that has not been winning, attitudes have to change... and this can be a huge obstacle. Changing attitudes involves many things and takes time. Losing will no longer be "accepted", but something to learn from. Players, parents, and the community must believe that with hard work, learning fundamentals, and good coaching, things can and will change. There must be a dedication to the cause, a belief in the "system", a commitment to the "team" (rather than the individual), and a singleness of purpose. Use motivational quotes if you find that helpful. Celebrate victories, large or small, team or personal. Impart a positive, upbeat approach. Be someone the kids like being around. Have fun. Make everything competitive... games, practices, drills, etc. Develop pride in your system and your school. We call ours "Rayder Pride". There is pride in representing your school and community. We expect all players to exhibit sportsmanship, respect others, be of good character, and follow the rules. Kids make mistakes, but that's what we strive for. Dressing up for games is important. We have our boys varsity players and our coaches wear our school sweater vest with logo, a white shirt and tie, and khaki slacks. It's an honor to wear that sweater vest. Players feel a sense of pride when they dress up for games. Each player also gets his own shooting shirt with his number. I have been told by an opposing fan that we always look very "professional" when we walk into a gym. Our girls varsity teams also dress up with skirts and logo-ed polo shirts. Building a "legacy"... after you begin achieving some success and have a few winning seasons, you want to promote this from year to year and keep it going. We talk about developing our legacy... not just one or two good teams, but good teams year after year. Former players will come back from time to time to watch a game, or to practice with us, or scrimmage against us. They are encouraging and helpful to our players, and help instill that sense of pride. Sometimes they give us a good laugh and tell stories about the time coach did this or that, etc. Set challenging goals for your program, your teams, and individual players. Then have a plan to accomplish each of these goals. These goals will depend on where you are with your program. Winning the state championship...maybe not. Winning the conference... maybe. Winning over 50% of your games this year, conference title next year... yes! Whatever they are, have something you are looking to achieve. Rumors and suspicion oftentimes start because of poor communication. Let people know what you are thinking (in general, without a lot of specifics). Communicate with your players as a group and one-on-one. The coach-player relationship is a vital aspect of your entire program. Players need to know that you care about them, not only as players, but as individuals. Maintain an "open door" policy. Before the season starts, meet with each player individually about goals, expectations, etc. Have occasional team meetings to discuss "issues". Ask players for their input. Communicate with your coaches and assistants. Encourage them to offer their ideas, but not to be offended if you stay with your own thoughts. You don't want "yes men"... you want assistants who come up with ideas, but at the same time realize that what the boss says goes, and are willing to support you and accept your decisions. Communicate with your school's administration and athletic director. Keep the faculty informed and gain their support. Ask them to inform you of players not attending class or not completing assignments. A motivational talk from you and a few extra sprints and lane slides, or some bench-time, can help revive a student's classroom attitude. Get the student body involved by speaking at pep rallies and student assemblies. Let them know how important their support is to the success of the team... they are the "6th man". But reinforce the importance of good sportsmanship. Keep the lines of communication open to parents. We have a parent meeting just before the start of every season, and a banquet at the end of the season. At the initial meeting, coaches are introduced, expectations, goals, policies, rules, etc are discussed. We explain that the only thing that is not "on the table" is discussing playing time, because parents can seldom ever be objective in this regard. 95% of parents are good people who care about their kids. Always respect that, and try to be on good terms, always showing concern and caring for their child, whether he/she is a great player or not. Unhappy parents can make you unhappy. Keep the community informed. If you are asked to speak at a local service organization, do it. Don't ignore the media. Before or after a game, radio commentators often want an interview. Make yourself available. Keep all comments positive and upbeat, even after a loss. As you become more successful, television reporters may come knocking on your door. Do the interview. It's an opportunity to promote your program, school and community. If they want to interview a player with you, allow it. It's a good learning experience for the player on how to respond "on camera", and this interview may give him/her some exposure, especially if a college scholarship is a goal. The late coach Al McGuire once said, "Don't let coaching become your mistress." In other words, maintain balance in your life and don't always choose basketball over your family, and everything else. Also remember that at the high school and middle school levels, kids and parents may not be as fanatical, or "gung-ho", about basketball as you are. It's not like a college program where players must "love it" or hit the road. I have seen a young coach come on so strongly and intensely, that he frightened away several good athletes, and they opted to play other sports instead. Allow them to be kids and have balance in their own lives. Surround yourself with passionate people. Surround yourself with people that believe in servanthood. The "Road To Greatness" says, "I have very little ability to finish anything on my own but if we get together, we can accomplish much." Do not allow anyone to come in and break up the family unity. A TEAM must be protected and nurtured. Think about whom you are and what you want to do and STAMP IT!! 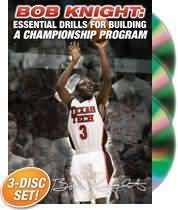 Many more basketball DVDs at the Coach's Clipboard Basketball DVD Store! This page lists a number of coaching DVDs pertaining to program development, and many coaching "gems". Head Coach University of Nevada, Reno; former Head Coach of the Sacramento Kings and Golden State Warriors. There are many DVDs of set plays in the Coach's Clipboard Basketball DVD Store... too numerous to list here! Keys to a successful program are being able to motivate and lead players. A number of excellent DVDs are listed on this page.